Winner of the Oshodi/Isolo Federal Constituency 1, Dr. Bashiru Dawodu, has presented his Certificate of Return to popular road transport workers treasurer, Musiliu Akinsanya, aka MC Oluomo. 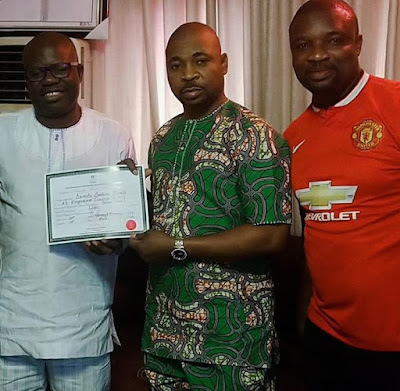 Dawodu, who is a member of the All Progressives Congress (APC), visited Oluomo’s home and thanked the NURTW leader for the role he played in his victory. Dr. Dawodu is a paediatrician once based in Camilla, Georgia, United States of America. He received his medical degree from the University of Lagos College of Medicine and had been in practice for more than 20 years.